Part of our work at Tropical Ghana is to preserve Ghanaian recipes for this and many generations to come; we have extended that to all our processes. We have taken steps that contribute to preserving our environment and preserving energy in all our activities. Additionally, we have reorganized our workspace to ensure that we are using environmentally friendly tools, equipment and materials. Not only is developing new relationships with partners that care about our environment important to us, but also we continue to review all our activities on a regular basis in line with our commitment to preserve our environment. In order to preserve the next generation, we have to preserve food. 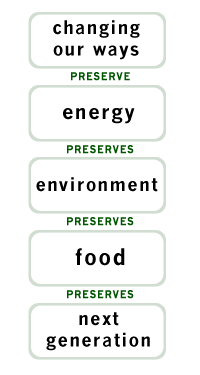 In order to preserve food, we have to preserve the environment. In order to preserve the environment, we have to preserve energy. In order to preserve energy, we have to be committed to change our ways and be moderate in our dealings.